The UBA5 is ideal for evaluating batteries from suppliers and verifying that they meet their published specifications. This is especially important when importing batteries from overseas where they can be more creative with their specifications. The first specification to check is battery capacity, which is straight forward when using the UBA5. Where the UBA5 really shines, is in it’s ability to run custom life cycle tests. You can specify the depth of discharge, the discharge current, the charge current and the charge algorithm. Then let the UBA5 do its work. Life time testing can take a few days for short tests, or months for testing hundreds of cycles. In addition, the UBA5 can control external devices during these tests, such as temperature chambers or external loads or chargers. 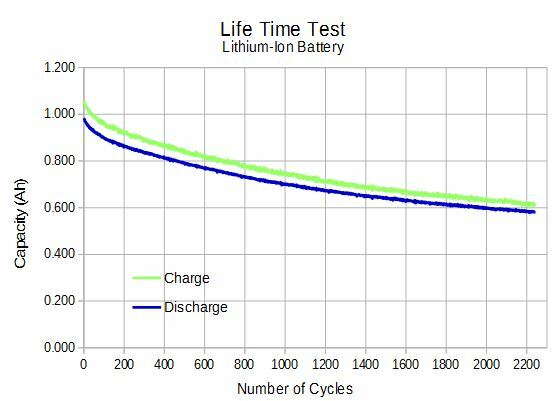 The following graph shows a life time test of a 1Ah lithium battery. A UBA5 ran over 2000 cycles on this battery over a period of 6 months. At 400 cycles the battery was down to 80% which is generally considered the end of life of that battery. But we kept on running the test. At 2000 cycles the battery was down to 60% of its rated capacity. So from these test results we can see a rapid drop in capacity vs cycle time, but then the decrease in capacity slows down.